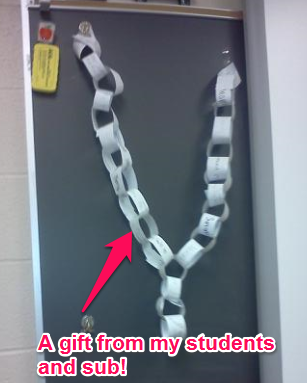 If you’re a substitute teacher, I have a cool idea to offer you . . . .
Well, I had a planned personal day last week and I was thrilled to find a small gift when I returned to my classroom the next day. You can see the beautiful gift in the picture below. I know you’re thinking – what the heck is that? I wondered myself when I saw it! Upon closer inspection, I saw that each link had writing on it. About that time, one of my students entered the room to see if I was back. She told me that at the very end of our study hall time, the students made this for me. My wonderful sub had suggested that my students write down what they liked best about me on each link! It was such a happiness booster! My students were so excited to read their messages to me, and I was so excited to hear them! When you receive compliments and funny messages from your students – it means a lot! I think this could also work for student birthdays, too. If any one out there is a sub – this is a really neat idea to tuck into your bag of tricks for times when you have 5 or 10 minutes to kill. At my school, we can often choose the person who subs for us, so this little trick could pay off for some subs who are looking for more phone calls. Believe me, this sub is on the top of my list! I’d love to hear from you if you use this little tidbit of advice! « Area, Perimeter, and Circumference Formula Foldable Reference!